Document existing interpretive technologies in the WAM and other museums. Assess the insights of WAM curators and other staff to determine how they use interpretive technology, and determine what the technical abilities of the WAM. Determine interpretive technology ideas and suggestions for the WAM. Decide interpretive technology for the WAM. Prototype decided interpretive technology and test with WAM staff and peers. Implement decided interpretive technology at the WAM. The Exhibits page in the website lists all the permanent exhibits in the museum as well as other sections of the building including the library and café. 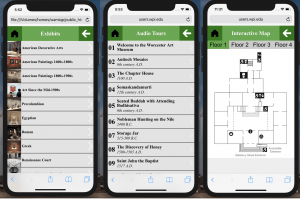 The Audio Tours page on the website takes all of the current audio tours found on the WAM’s existing mp3 players and makes them accessible to the user on their mobile device. 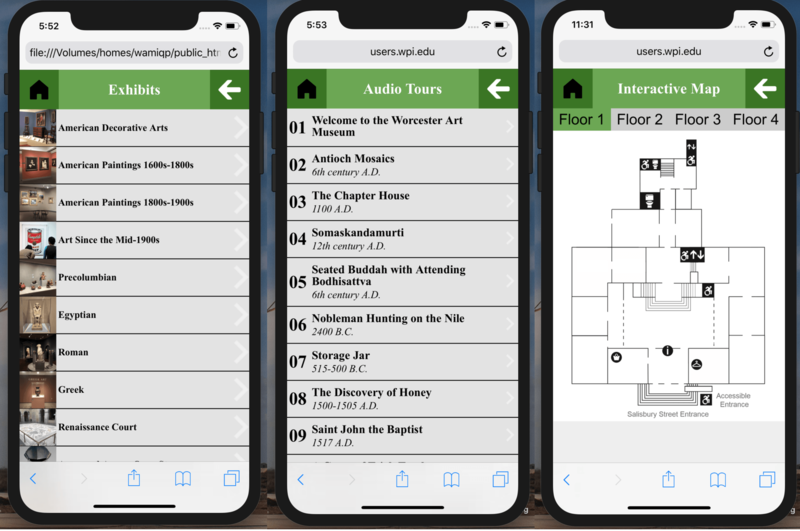 Since the audio tours are labeled by number, the user can scroll through and search for the audio they want to listen to. The Interactive Map page gives the user the ability to plan out and personalize their visit to the museum. The map can allow visitors to guide themselves around the museum while inside. Each of the floors can be viewed by pressing a tab with the corresponding name. A humorous promotional video for the mobile website was also created, the purpose of which is to connect especially with high school, college students, and anyone app-inclined in the Worcester area to influence them to visit the museum, and to use the mobile website. The video also shows off the features of the mobile website and how it is navigated. The video will be distributed on the Worcester Art Museum’s website as well as on the project website which can be found on the title page of this report. Beyond creating the new WAM Mobile Website we left recommendations for its further development including adding new features to the mobile website, further development of current features and improving the sustainability of the mobile website.